Everyone’s favorite hero turned villain turned hero again has finally joined the S.H. Figuarts line! It’s been a long time coming but the rider with the tightest pants, the sweetest ride, and the ax that looks both ways before crossing the road has arrived! Today we take a look at S.H. Figuarts Kamen Rider Chaser! Chaser is final rider needed to complete the basic Drive trifecta. As one of the last few remaining scheduled releases for Drive, he’s absolutely one of the best. Chaser is a sleek back to basics design that goes for a more symmetrical look any of the Drive riders. Included with him is his packaged separately headcrest, 2 sets of hands, his Signal Ax, and an effect part for it to replicate the “stop” & “go” of his Full Throttle Across Breaker attack. After handling him for this gallery it’s safe to say that Chaser is an absolutely solid release that will look fantastic in your Drive display. It’s one of the best figures released in this sub-line. Another day means another chance for all our users in Toku Toy Box! It’s been a long time coming but Bandai has finally delivered the goods for Mashin Chaser with the release of the new S.H. Figuarts Busou Chaser set! The Busou Chaser set as the name implies is a vast accessory set meant for use with your S.H. Figuarts Mashin Chaser. A set which gives Chaser access to his E-Circular weapon pack as well as it’s alternate weapon modes like the Fang Spidey, Tail Whipper, & Wing Sniper! But perhaps the most striking accessory in this set is the MASSIVE pair of Wing Sniper Wings. An incredible piece these wings make Mashin Chaser look absolutely devilish and complete his look in the best way. As far as accessory sets go this one is top notch! But please do check out our full review and complete gallery after the jump. We’ve assembled over 60 images of the S.H. 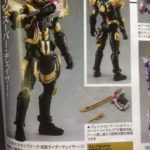 of the Figuarts Busou Chaser Accessory set after the jump, to see them all click “Discuss on the TokuNation Forums” at the bottom of this post. And don’t forget this is gallery qualifies you for entry in our Toku Toy Box Giveaway! That means all you have to do is post something relevant to the conversation and you’re entered for a chance to win! Before the Roidmudes came in full force & Shinnosuke Tomari took up the mantle of Kamen Rider his predecessor roamed the streets saving the world in secret. 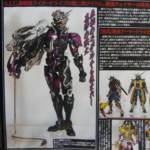 Today we take a look at a long awaited release, a recent Tamashii Nations 2015 exclusive, S.H. Figuarts Kamen Rider Proto-Drive! A remold/repaint of the Drive Type Speed Figuart, Proto-Drive represents the initial form taken by Chase before his transformation into the Roidmude reaper Mashin Chaser. A simply gorgeous figure Proto-Drive comes in the same basic box as Type Speed & also brings with it a rather lackluster accessory count. But the figure more than makes up for it with pure style. While Proto-Drive may not have all the bells & whistles of a standard release it looks stunning and will more than compliment any Kamen Rider Drive collection. Plus he just looks right at home on the Ride Chaser! We’ve assembled over 40 images of S.H. Figuarts Kamen Rider Proto-Drive after the jump. Click “Discuss on the TokuNation Forums” at the bottom of this post to see the full gallery and review!